Digital spaces, like physical spaces, can bring people together. Google Commons is a web-based communication platform within Google's Education suite that is built on collaboration and socialization within high school communities. Students and teachers in the high school environment communicate like it’s the Stone Age. Communication is crucial to fostering a good learning environment for students. Students and students evidently don’t communicate in this antiquated way - between Facebook, Instagram, Skype, and you name it, technology is their third arm and they are using it to collaborate, learn, and socialize. Email, Google Docs, and scattered learning management systems like Abel Moodle and D2L are the largest players in the space. However, despite plenty of digital tools to help students do work and hand in work, there are no options to help create the candid cadence of communication that can create a sense of community. How might we use a digital platform to promote communication among an individual school community? Students, teachers, and admin are automatically a part of the school’s network through their Google accounts. Announcements and classes are populated according to each student and teacher. Anyone can easily start a group or individual message. Built for collaboration, the drawing, sharing, and calling features make it easy for students to work together on any assignment. Google Drive, Classroom, and Calendar can all be easily shared and referenced from right within Google Commons. You can review and share documents without leaving the window. I started this project actively interested in the education tech space, wanting to develop a learning management system for high school students. Three minutes of conversation with my 15 year old brother revealed that while fragmented, this already existed. Improvements were clearly needed, but this didn’t seem to be a pain point for students nor teachers. Besides, coming into a space I know nothing about (besides anecdotally) and presenting a solution was not what 10 weeks of design school taught me, come on! With my backpack equipped with granola bars and determination, I set out to understand more about the current state of high school education in Toronto in first person. I asked broad interview questions, trying to pin point the education experience from each of these vantage points. Do you like school? Why do you come to school? On a scale of 1 - 10, how much do you think your school is integrated with technology? If there was a tool you could have to help you with school, what would that be? How has teaching changed over the last 10 years? What role do you think technology plays in teaching? After all these conversations, I wrote key points on sticky notes so I could visualize clustering themes. Adoption: What is the use of any platform that people aren’t using? Teachers have varying appetites for trying new technology. This inconsistency gives students a disjointed experience and departs from the vision of many learning management system makers. Resources: Teachers are often not given support to learn about and implement new technologies. On top of their existing responsibilities, this can be a lot of work they are not given additional compensation or time for. Additionally, schools in general lack infrastructure support to roll out new initiatives - some schools are just getting WiFi. Value Proposition: Marketing can make many education tech platforms sound awesome. However, it’s a tough sell to teachers and administrators being inundated by new tools all the time. What value is this really going to bring to my classroom? What are individual education dashboards going to do for my class of 30 and how should I teach in response to that? The lack of a clear outcome for teachers detracts them from wanting to even try them. Mental Health: Both students, teachers, and administration acknowledge that students are under more stress than ever. The competition for the best scores to get into university present constant pressure. Learning Styles: We don’t exactly agree on what the changing learning outcomes should be yet to be effective in the 21st century - many are experimenting. However, the fact that people learn, express, and excel in different ways is a universal theme. The need to incorporate different learning styles both in teaching and assessment is a core discussion topic in the learning space. I chose to tackle the communication theme because it ties in with mental health and can have implications on learning styles. After further consulting principals and teachers, we all agreed that given my timeline and distance from the industry, learning styles would be too ambitious to address as a standalone. On top of that, many of the ideas that came out of experiencing school were not technologically driven, but technology was one that could benefit vastly from technology. My mentors helped me identify the parallel between the evolution of tech in the education space and the work space. Key insight #1: Communication could be vastly improved using a digital solution. Key insight #2: Slack is making ways within the communication space for work, and its concept could be emanated for the high school education space. Key insight #3: Among all digital education tools, Google Drive and Gmail (Docs, Sheets, and Slides) are the most widely adopted. 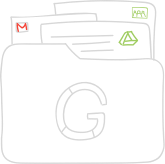 Every TDSB student and staff have a gmail account associated with school, thus automatically a part of Google’s education suite. At the intersection of these insights came Google Commons - an online digital space where students, teachers, and admin could freely socialize, learn, and collaborate. Job Story: When I communicate with students, I want to easily access the entire class so I can ensure everyone feels supported. Job Story: When I am supporting a new school-wide technology, I want to ensure the safety and participation of all students so I can create an inclusive community. It was easy to get distracted trying to build a platform with so many possibilities. I chose to focus on the student's experience in collaborating on a project as the product's core. I started user testing at the wireframe stage, looking for interface and flow feedback from students and teachers. I roughly built out the user flow in wireframe form and showed it to 5 students, 1 teacher, and 2 peers. Since Google Commons is part of the Google suite of tools, naturally the in-app branding would reflect Google. Using the Material Design Guide and this guideline as reference, I started to immerse myself in the world of shadows and subtle rounding. The logo would be the most distinct part of this branding. I started by sketching out symbols of communication. I wanted one look to convey communication, blend in with Google’s other chat apps, but also be immediately obvious it was for school. The marketing and on boarding aesthetic would feature fun doodles on bright photography. The copywriting and messaging will reflect the light and welcoming tone. The first draft of the home screen in high fidelity set the colour and aesthetic of the major components. Continued testing yielded the following: calling was a feature I neglected, architecture of certain features like "search" didn't make sense. Continued testing forced me to re think the information structure and identify which features were actually important for this education platform. It took a week of working through this to realize how important details were, so the pixel pushing began and I was able to bring it to a polished state. How will this platform differ from others who have tried to introduce digital communication tools into the space? Let’s revisit each barrier. By being a part of the Google for Education suite, all parts of this ecosystem is already signed up for the product. We have already bypassed the first step of adoption. Given my tight timeline for research, conceptualization, development, and testing, I focused on creating a product that met the core need. However, this has potential to turn into a real community. The following are future considerations. Google Commons was designed as a web app because it is the most universal reaching. Some students may not have phones. However, the majority of them do and having this on mobile will be key to its future success. In creating the space for students to talk about class material more candidly, teachers can capitalize on relevant content that come up during conversation. Teachers and peers can be accessible for specific needs on demand. Extra curricular activities are essential to the school community and thus a natural stream of the platform. These can be organized the same way as classes, automatically set up to include the executive members of the team with new members added over time. This was my first time designing an entire product from scratch, from figuring out the need to creating and testing the UI. I came through with a keen awareness of the challenges faced at each stage of the design process, both personal challenges and challenges that all designers face. This diagram accurately captures my ups and downs throughout the process. Through doing my own research, synthesizing insights, deciding on a user flow, designing the UI and testing at all stages, I have polished up my skills as a well-rounded designer. Moving forward, I know I want to strengthen my prototyping chops and develop a deeper understanding of research processes. As I continued to talk to people, I started to learn how important it was to ask the right questions and be specific about what you want to learn at each stage of the process. During the discovery phase, I asked more open ended questions. While those are very insightful, I needed to narrow it down to tangible concepts I could test, and eventually did so. During the user testing, I had to keep in mind that the success of some users does not eclipse the confusion of other users. Details have never been my forte, but I have truly internalized their importance working through his project. It’s difficult to mind the details when you don’t even have all the pieces figured out. However, when I finally went back to ensure everything was pixel perfect, everything that seemed “off” about the UI changed. I now have experience implementing the Material Design guide. Doing research, testing, and getting feedback are all essential - but achieving balance and maintaining focus between all the information coming at you is essential. At the end of the day, I’m the designer, with a certain sense of intuition and acumen to help guide me between the clutter. Which path should I take between all these opposing opinions? Right at the beginning of my project this was an issue - students, teachers, administrators, consultants, research papers and ed tech marketers all had different perspectives on which avenues would yield the highest impact. Mentors helped me stay on track by continually reiterating the core problem I was trying to solve. Another part of achieving balance is the balance between organization and ideation. What I mean by this is the etiquette with which I’m designing - when is it time to push pixels into perfection? If I do that too early in the process, it can be a waste of time because the ideas are constantly changing. When should I be trying to re-invent the wheel and when should I just take what’s already tried and true? All these questions will clarify themselves with experience, and this project is only the beginning. Hope you enjoyed the journey as much as I did!